A visit to Druids Glen is an unforgettable escape from the hustle and bustle of Dublin city. Located in the beautiful surroundings of the Garden of Ireland, the lucky winners will enjoy a luxury overnight stay to recharge the batteries. This prize includes one night’s accommodation in a superior room for two people, along with prosecco and chocolates on arrival and breakfast the following morning. 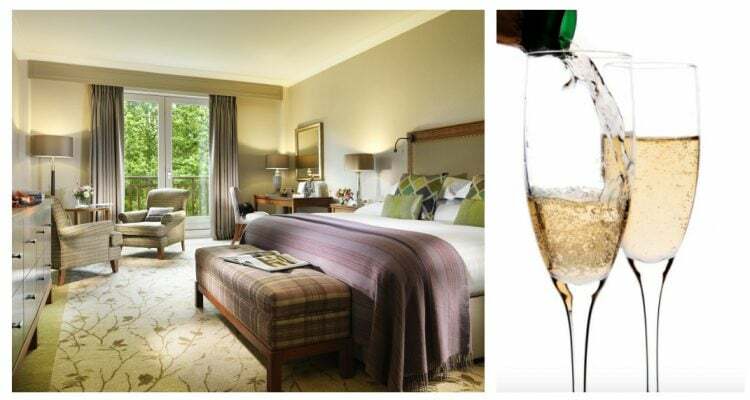 At the five-star Druids Glen Hotel & Golf Resort, nature and luxury meet to create a memorable experience, nestled in 400 acres of countryside between the Wicklow Mountains and the Irish Sea yet only thirty minutes from Dublin. Retreat to the privacy of one of their 145 spacious guestrooms where comfort and understated luxury prevail. Dine in the stylish, airy surroundings of Hugo’s Restaurant, which holds two AA rosettes, and offers a superb culinary experience using fresh Irish produce. Enjoy more casual dining in the Garden Rooms or Afternoon Tea in the Sycamore Lounge. For an alternative dining experience, enjoy the period charm of Woodstock House, a wonderful 1700’s period house steeped in history, with its fantastic setting at the 1st tee on Druids Glen and includes a rooftop terrace with panoramic views over Druids Glen Golf Course and the Irish Sea. Indulge in their Spa which offers seven treatment rooms and a tranquil relaxation suite to unwind after your treatment. You can also enjoy the facilities in the Druids Glen Health Club – overlooking the stunning grounds with an 18-metre pool, Jacuzzi, steam room, sauna and fitness suite with a wide array of equipment and a programme of fitness classes. Follow in the footsteps of legends and play two unique courses in one stunning location. Their two championship golf courses, Druids Glen and Druids Heath offer varied play over equally exhilarating landscapes. Whether you are staying for golf, spa or a romantic getaway the resort offers a range of wonderful facilities and activities. Add in all that Wicklow has to offer, Druids Glen Hotel & Golf Resort is an ideal choice for a break away.